New York, NY – May 18, 2010 – 2K Games announced today a partnership with NVIDIA® to bring NVIDIA PhysX® technology to all versions of Mafia® II, the epic mobster crime drama coming to the PlayStation®3 computer entertainment system, Xbox 360® video game and entertainment system from Microsoft and Windows PC. Additionally, the Windows PC version will feature a thorough integration of NVIDIA PhysX and 3D Vision technology into 2K Czech’s Illusion Engine™. 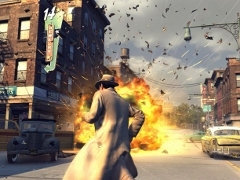 Mafia II will be the first Windows PC game ever to utilize the NVIDIA APEX Clothing module, providing an immersive gameplay experience in the world of 1940s and 1950s Americana. The integration of PhysX and NVIDIA APEX technology, including the APEX Clothing and Particle modules, enable the city and personalities of Empire Bay to truly come alive on Windows PC. The NVIDIA APEX Clothing module allows for more dynamic movement in clothing, making in-game characters even more realistic and reactive to environmental conditions. With the implementation of NVIDIA APEX Particles, players are engulfed in lifelike explosions that are bigger and brighter, including weapon fragments, in-game debris and destructible environments that are amplified in both quantity and realism through the integration of APEX Particles. For example, a pistol fired into a glass pane will emit hundreds of glass shards; a shotgun blasted through a wooden landing will splinter the wood; and a Tommy Gun will chip into a brick or stone wall to methodically fracture and break it into pieces. Mafia II for Windows PC will also be playable in full stereoscopic 3D, courtesy of NVIDIA 3D Vision* technology, which combines high-tech wireless glasses and advanced software to create an impressive element of authenticity and immersive realism. Players will be blown away by the added depth of field on display as particles and explosions come off the screen in thrilling 3D. Mafia II will be available in North America on August 24, 2010, and internationally on August 27, 2010. Mafia II is currently in development by 2K Czech, the same creative team behind the award-winning, genre-defining Mafia®, which captivated millions of gamers around the world. For more information on NVIDIA APEX, please visit http://developer.nvidia.com/object/apex.html. For more information on NVIDIA 3D Vision, please visit: http://www.nvidia.com/3dvision. NVIDIA is really pulling out all of the stops on this one. Check out the screens they shared to show off the new effects.